This book is written because we do not believe that failure is inevitable. 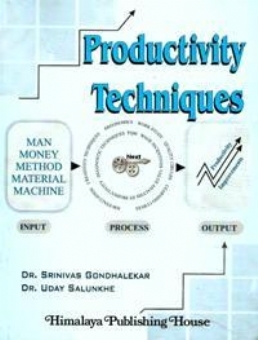 Indeed, with the vigorous application of Productivity Techniques and Concepts described in this book, any individual with the will to do so can face up to any competition. More important than those techniques is the attitude of mind, not just of managers and workers, but primarily presidents, chairmen, and directors. Only deep and sustained commitment at these level will give a hope that the budding managers absorb the best and in turn provide the same to the society. All examples that appear in this book reflect the true experiences of active managers. Dr. Uday Salunkhe, a mechanical engineer with a management degree in Operations pursued his doctorate in Turnaround Strategies as his major. He has 12 years of experience in the corporate world, which includes his tenure with Mahindra & Mahindra, ISPL and other companies. Owing to his valuable experience, he has turned around a number of sick units in India. He is presently Director of Prin. L.N. Welingkars Institute of Management Dev. & Research. He has transformed the institute and brought it to the forefront in management education. Dr. Salunkhe has been invited as visiting fellow at Harward Business School \ USA, European University \ Germany, as a part of the effort to benchmark the management curriculum on the lines of leading business schools abroad. He is also associated with a number of Universities abroad, Wharton & University of Chicago to name a few. At Welingkars, Dr. Salunkhe has taken the lead by innovating models, which have given a new dimension to management education. These include the BTS (Build Transfer Support) model, the Career Counselling Centre, CAN group and Management Development Program (MDP). Superior Performance and Most Outstanding Entrepreneurial Project at Asian Institute of Management 1997. The Best Teacher of Management for 1997-1998 by the Indian Express Group and Best Teacher of Management 1996-1997 by Bombay Management Association. He was awarded scholarship in Quality Management by AOTS, Japan. Dr. Uday Salunkhe has also been involved in the official bodies of the university of Mumbai and the Directorate of Technical Education to improve the quality of management education. Dr. Srinivas Gondhalekar did his B.Tech from HT (Bombay). He did his Post Graduation in Industrial Engineering from the National Institute of Industrial Engineering (NITIE). He completed his Ph.D. from ITT (Bombay) in Productivity Management by using Kaizen: An experimental Study He is the twice recipient of the prestigious AOTS (Association For Overseas Technical Scholarship) award for study in Japan. Subjects of his study were Quality Management & CHRD & Corporate Management. He has also done a certified Course in Value Engineering. Dr. Gondhalekar was with Godrej Soaps Ltd. for 15 years and had worked in various capacities. He has been teaching this subject of Productivity Techniques for the MMS course of Bombay University since 1985. He is a full time faculty at Prin. L. N. Welingkars Institute of Management Dev. & Research. Dr. Gondhalekar is presently the CEO of Kaizen Institute of India5. He is an authority in Kaizen and has been consulting in Japanese Style of Management in many Indian Corporations. He has done a short assignment for UNIDO in Zambia, Africa where he delivered lectures on Japanese Style of Management.